An Alpine haven rests in the mountainous countryside of northern Italy. Bormio, Italy is a small Medieval village whose appeal changes with the seasons. Each winter, ski enthusiasts arrive from all over to zip down its grand ski slopes. Additionally, summer is a wonderful time to hike and refresh at one of the region’s wellness hotels. Bormio is home to just 4,100 residents. For this reason, planning an exclusive vacation is an easy affair. Two lovely hotels sit atop the healing thermal waters of the region. Both of them offer superb spa amenities. Grand Hotel Bagni Nuovi and Grand Hotel Bagni Vecchi boast a relaxing boutique experience for the luxury traveler. An opulent pink hotel graces the alpine landscape of Stelvio National Park. Grand Hotel Bagni Nuovi invites you to indulge in a “wellness vacation” as you absorb the relaxing stillness of the region. Decorated in Art Nouveau fashion, the splendor of the hotel creates a posh atmosphere reminiscent of a previous era. In the same fashion, I imagine formally dressed guests of the early 1900s looked quite glamorous as they dined in the fancy ballroom. The common areas of the hotel ooze luxury, but in contrast, the guest rooms are quite simply furnished. To clarify, they are elegant, but notably modest. The polished wood floors gleam against the natural palette of accent fabrics. Suites overlook either the Valdidentro or the cliffs of Stelvio. Regardless of which room you choose, you will wake to an incredible view of the Italian countryside. Grand Hotel Bagni Nuovi’s main appeal is the thermal spa – Terme Bagni Nuovi. The Romans discovered the thermal springs over 2,000 years ago. They frequented the waters for their warmth and healing properties. Today, the spa utilizes the region’s naturally flowing thermal water to fill its pools and soaking tubs. Naturally, the warm water maintains temperatures ranging from 37-43 degrees celsius (98.6 – 109 degrees fahrenheit). Perfect for a detoxifying soak! Plus, the clever layout of the hotel ensures you experience ultimate privacy. Furthermore, each guest room connects to the spa via a private entrance. You don’t need to worry about dressing before you make your way to the spa. Throw on your bathrobe, and stroll to your morning massage or facial! Dining at Salone dei Balli, the hotel’s historic restaurant, is a culinary delight. The restaurant’s opulent design sets an impressive tone for your evening. Gleaming pine floors reflect the shimmering light of crystal chandeliers. Arched windows are framed by intricate floral reliefs. Views overlook the marvelous mountain range below. Not to mention, the grand fireplace provides a stunning focal point for the room. Furthermore, all of this grandeur is complimented by tasty regional creations concocted by the chef. Described as a “Medieval fortress” the sister hotel is Grand Hotel Bagni Vecchi. In contrast to Bagni Nuovi, it offers a simpler setting for a wellness vacation in Bormio, Italy. 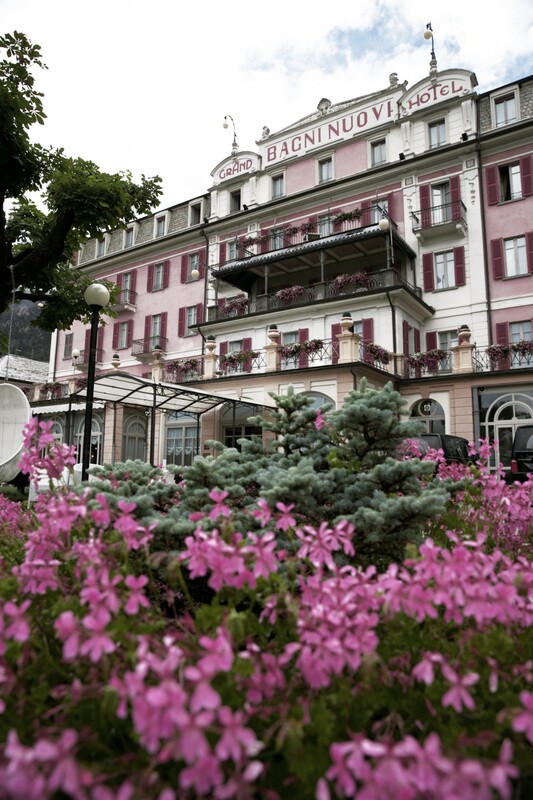 With only 36 guest rooms, the intimate atmosphere of the hotel exudes historic alpine charm. Rooms are simply furnished with hand decorated wardrobes and fair wooden floors. Dark wooden beams accent the creamy color of the walls creating a romantic yet rustic vibe. Antica Osteria is the main dining option at Grand Hotel Bagni Vecchi. Sip fine Italian wines and taste dishes native to the Valtellina valley. Plus, admire the panoramic view from the cozy restaurant. Or perhaps if you’re on the go, you can stop by the cafe for a quick snack or light buffet lunch. Similar to Bagni Nuovi, the main attraction at Bagni Vecchi is its historic spa. Tunnels carved from rock lead to the thermal waters, which spring straight from the earth. Dating back 2000 years, timeless amenities encourage total relaxation. Choose to bask in the coolness of a Roman bath, or venture through the grotto to a steamy Turkish bath. In like manner, the Medieval bath combines soaking in thermal water with time spent in the sauna. There’s no doubt, my favorite part of this boutique hotel is the panoramic pool. In any season, you’ll enjoy a beautiful view of the landscape while you swim. It most certainly is a pool-lover’s dream! 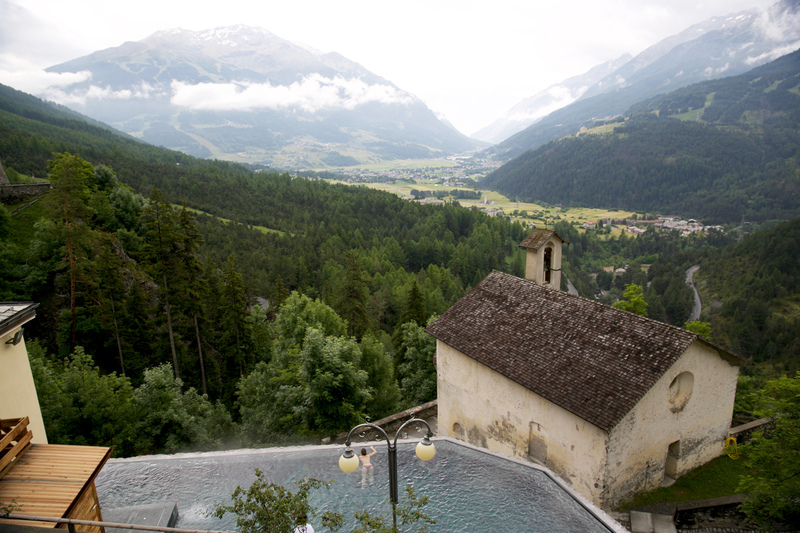 In short, serenity will surround you as you look out over the Bormio Valley. Of course you will want to venture beyond the walls of your hotel and the village of Bormio, Italy. The medieval town is connected by cobble-stone streets and divided by stone fountains. Arched doorways reflect the Roman inhabitants that once traversed the winding lanes. During the winter months, snow sports dominate the itinerary. The alpine mountains serve as a snowy playground for many adrenaline-seeking travelers. Excellent runs criss-cross down the length of the mountain ranges. Make note, Pista Stelvio is the area’s most famous ski route. In fact, it is regularly included in the World Cup’s ski circuit. In this case, be sure to spend a day sliding down the slopes! Afterwards, indulge in an end-of-day beverage at the local Apres-Ski. Notably, not as wild as some of the Apres-ski joints in other parts of Europe, there are still several excellent options. For example, BeWhite and Rocca house serve cocktails to giddy visitors at the base of the Pista. Beyond the town of Bormio, Italy, a dog-sledding adventure awaits! Husky Village is home to 48 Alaskan Huskies. It was founded in 2002. Notably, by an Italian who previously learned the art of the sport in Alaska. His friendly staff will whisk you away on a mountain trek where you will learn the basics of dog-sledding. These excursions are available year-round, and are a fun way to spend an afternoon. As you can imagine, during the summer, hiking and cycling are popular activities. Stelvio National Park is the largest in Italy. Its wooded forests, mountain ranges, and calm lakes stretch across the central region of the Alps. Miles of hiking trails wind through the countryside. Pack snacks and water, and you can spend a day exploring the rugged nature of Bormio, Italy. There are a few notable things worth mentioning here. The Kuerc is located in the city center, and serves numerous local favorites. Pizzoccheri is a delicious dish of noodles, potatoes, cabbage and cheese. Additionally, the Sunny Valley Restaurant atop the Santa Caterina mountain is an excellent choice for a view. You’re taken up the mountain by snow-cat (a large vehicle that plows snow). You can either ski back to town or catch a ride by the same vehicle. Bormio, Italy is the perfect destination for your next wellness vacation. Do as the Roman’s did and rejuvenate in Mother Earth’s warm waters! 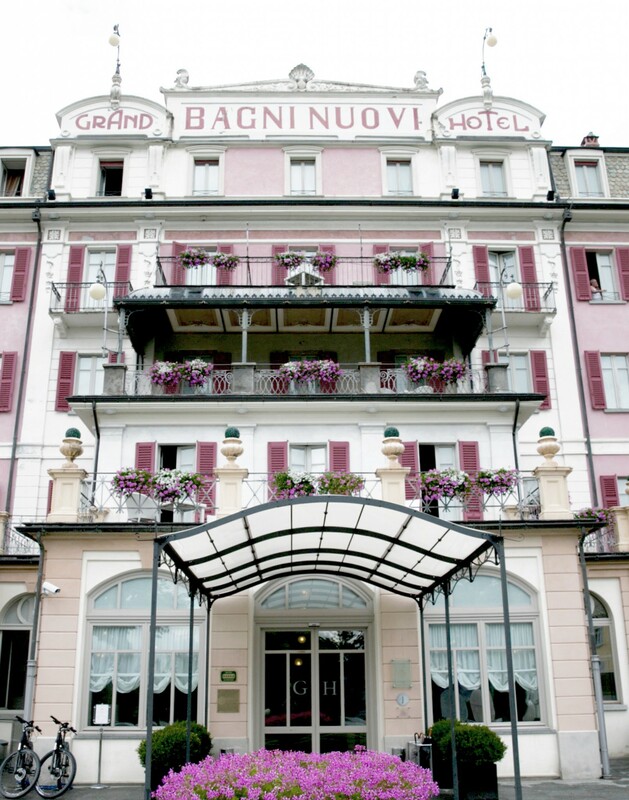 Whether you choose Grand Hotel Bagni Nuovi or Bagni Vecchi your stay will be incredible! 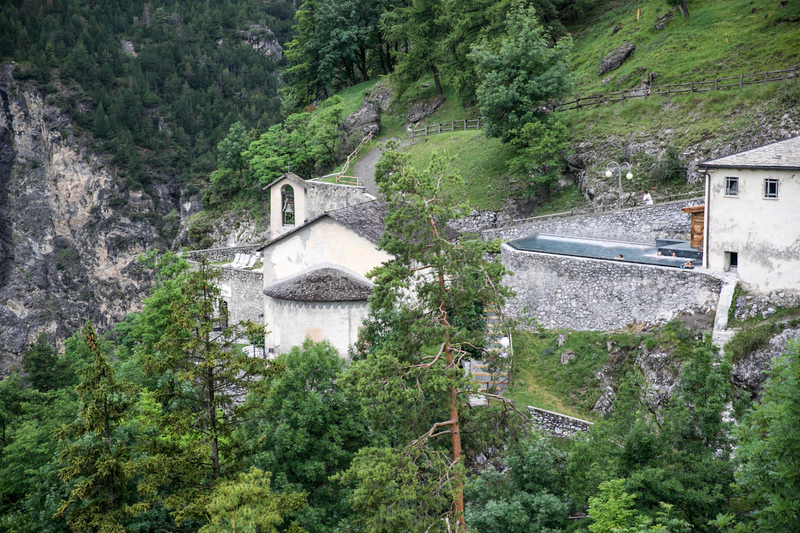 Use my guide to detox, dine and discover in this beautiful Italian region of the Alps. Looking for more interesting Italian cities? Check out my trip to Matera, Italy. Beautiful village. I’m surprised that despite the fact that there are only 4,100 residents in the area, the hotels are pretty big. The Kuerc is located in the city center, and serves numerous local favorites. /// Maybe you’d like to re-check this.